DREAM BIG MOVIE QUOTES - This is a gift a princess-lover will enjoy! Four fantastic girl power quotes are perfect for empowering little girls, improve imagination with role-playing and storytelling! 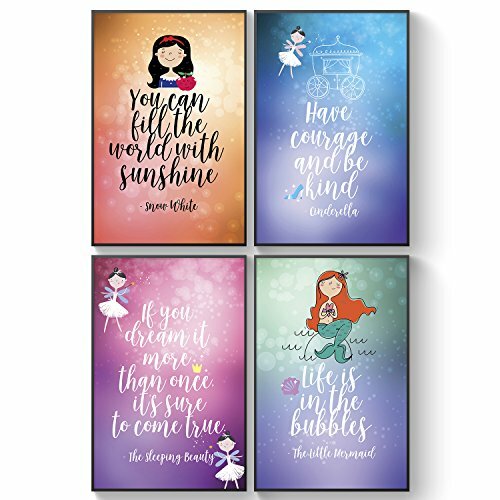 It works as a great magical themed girl's room, Princess bedroom decor, Disney themed bathroom or fairy world kids playroom decoration. FAIRY MAGIC KINGDOM GIFT - Our brand design wall decals are a great birthday gift for both kids and teens! Let your boho / cheerful flow come out and give it as a novelty and holidays gift idea, baby shower, new parents and new mom shower party present, newborn, and babies first gift. School gift idea from Mom to Daughter. It is also perfect for her, sister, sister in law, cousin, and best friend gift. THINK ABOUT THE PLANET! This set of 4 art prints 11x17 are printed on thick, eco-friendly quality paper from reforested areas in Guatemala. With that in mind, our creative team and designers went to the drawing table to come up with an adequate format that helps us create the littlest waste possible and avoid unnecessary pollution. We really care about preserving and giving back to our planet!